On this trip we will start a leisurely ride on quiet roads along Siem Reap River, observing the close connection between the river and those that live on its banks. Our first stop will be to explore an ancient pagoda and learn about its importance to Siem Reap. We'll soon find ourselves riding on a dirt road as we cycle in the countryside and in the middle of numerous rice paddy fields. 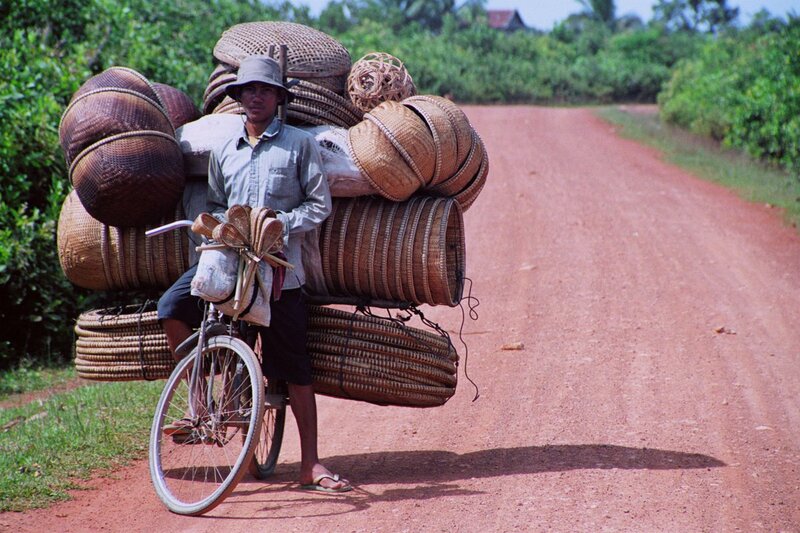 Bota is our guide for the cycling tour of countryside Seam Reap. He is professional, experienced and caring. He tailor-made the route for the two of us who only go cycling once a year. The experience is a great way to see the countryside through cycling and tasting different kinds of local food which is very impressive. Would not hesitate to recommend the tour! Our guide, Mr. Bota, was absolutely excellent. He made the experience simply amazing for my 8 year old daughter and he was a wealth of good humor and information. An early pick up to get a jump start on the heat. Once our bikes are adjusted we start a leisurely ride on quiet roads along the Siem Reap River, observing the close connection between the river and those that live on its banks. We first break exploring an ancient pagoda and learn about its importance to Siem Reap. We'll soon find ourselves riding on a dirt road as we cycle in the countryside and in the middle of numerous rice paddy fields. Rice production is vital to Cambodia's agrarian society and is the base of almost all dishes. The vibrant green rice stalks turn to to gold when ready to harvest and we are likely to see farmers in their fields with their water buffaloes. We cycle through villages, saying hello to the curious children and seeing typical village activities such as hand weaving bamboo baskets. We'll take another break and visit a natural palm sugar producer. We'll learn how to harvest and boil the liquid into hard sugar, and of course have a taste. Now that we have burned some calories, it's time for lunch and more tastes of Cambodia through the local cuisine. We'll eat at a restaurant near West Baray, a rectangular earthen reservoir. Once sated it's back on the bikes for more riding and taking in the serene life of rural Cambodia before we head back to Siem Reap. This easy 40 km ride, starts on a smooth tarmac city road then continues to dirt countryside roads. Be sure to bring your cameras so you can capture the beautiful scenery along the way.